I know that this show isn't until Saturday but I just realized that Mynabirds' show at the Mohawk is an inside show so, I want to make sure you have a chance to get tickets before they're gone! How's that for a run-on sentence to open a post? 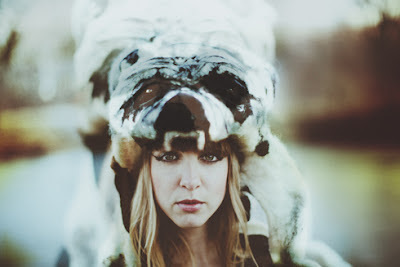 Mynabirds is singer-songwriter Laura Berhenn's post-Georgie James project. It features a rotating cast of amazing musicians, most of whom are based in Omaha. Laura and many members of her touring band, have been a part of the latest incarnation of Bright Eyes on Conor Oberst's most recent tour. These are seasoned pros with chops to spare. Mynabirds' latest record Generals is filled with beautifully written songs, wonderful textures and gorgeous, haunting vocals. If you're a fan of St. Vincent, Neko Case or Eleanor Friedberger then you should be at the Mohawk Saturday night. Taking the stage right before The Mynabirds Saturday night is Austin 2-piece Deep Time. You may remember them as Yellow Fever or maybe you've never heard of them at all. I just discovered Deep Time about a month ago when I received a press release mentioning that they were on Hardly Art Records. I listened to the Soundcloud link based purely on the fact that they were on Hardly Art and within 30 seconds of listening to clouds i was completely sold. It's jangly, disaffected, indie-pop with Stereolab-esque vocals. What more could a person ask for these days? Arrive early if you want to catch Deep Time and arrive even earlier if you want to catch My Jerusalem. They go on first Saturday night on the Mohawk's inside stage. I'd expect them to start around 10pm. If you haven't seen this local band yet, you should at least give them a listen over at Bandcamp and if you like it, get to the 'Hawk early enough to catch them.